Royal Green Turmeric Complex contains a powerful combination of turmeric, ginger and black pepper. Turmeric supports the digestive system and a normal liver function. 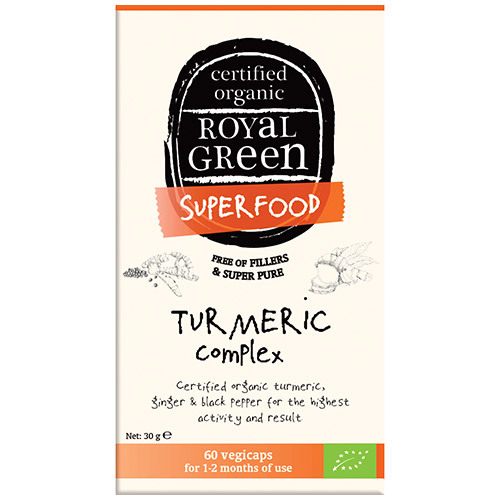 Royal Green Turmeric Complex is certified organic, free of fillers and super pure. Turmeric (Curcuma Longa), Ginger (Zingiber Officinale), Capsule: HPMC, Black Pepper (Piper Nigrum), Anti-Caking Agents: Talc and Silicon Dioxide. Take 1-2 vegicaps per day, preferably with a meal. Below are reviews of Royal Green Turmeric Complex - 60 Vegicaps by bodykind customers. If you have tried this product we'd love to hear what you think so please leave a review. Royal Green Turmeric Complex contains a powerful combination of turmeric, ginger and black pepper. Turmeric supports the digestive system and a normal liver function.